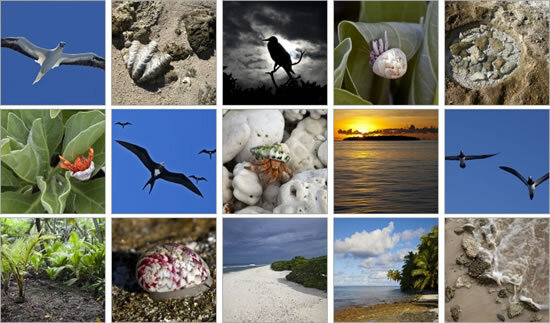 The first thing you notice when stepping onto the islands of the Chagos Archipelago are the many crabs. 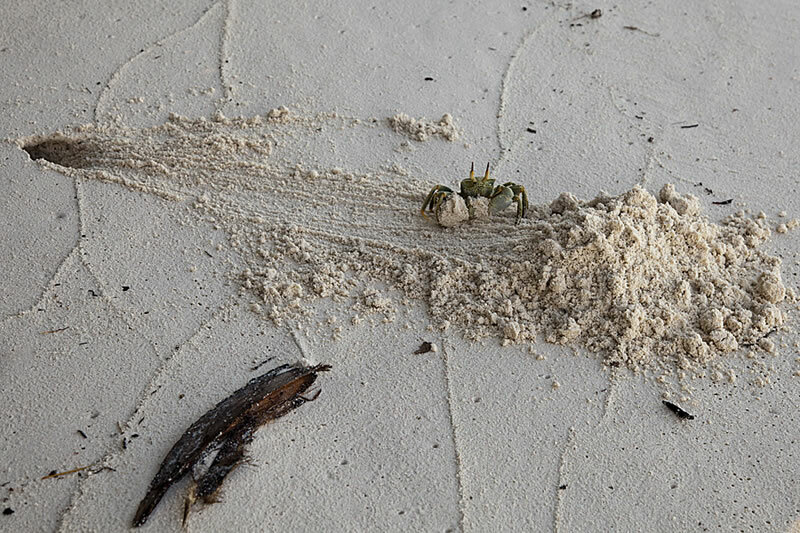 From the rock crabs at the water’s edge to the plodding hermit crabs and scurrying ghost crabs along the sandy beach to the coconut crabs that inhabit the understory of the dense coconut forests, the islands provided a wealth of interesting arthropods at ground level. 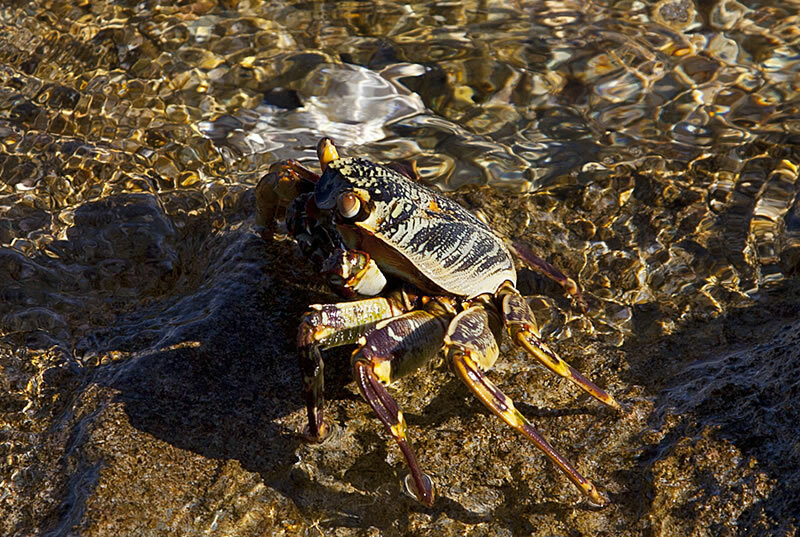 Luckily, the most commonly seen crabs were relatively easy to identify and so here is a little information on several of the crab species we encountered while on the islands. 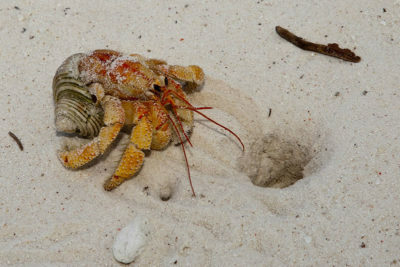 Probably the first crab we all noticed was the brightly colored Strawberry Hermit Crab. This crab species is widespread across the Indo-Pacific and due to its colorful carapace it is sometimes collected by hobbyists who keep them in terrariums. Though they may be long lived in the wild (25-30 years), they seldom live for more than a few years in captivity. This hermit inhabits a variety of discarded gastropod shells in which it keeps a small amount of seawater to keep its gills moist so they function properly. Though they can travel a distance inshore, they regularly return to the sea to refresh this water supply. They can also bury themselves in damp sand as a means to keep cool and prevent water loss. They are an efficient scavenger and are quick to clean up any decaying organic matter that is washed ashore. We saw large colonies of these bright red hermits along the beach in such numbers that it made me wonder what they could possibly be eating to support such high densities. Though online sources indicate that this species is nocturnal, hiding away during the heat of the day, we saw many out and about during our daytime visit. 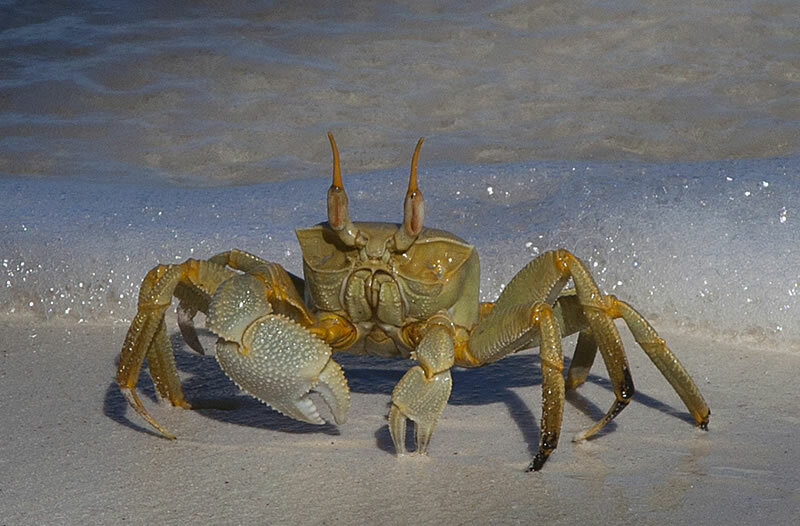 The other crab species commonly seen along the beach is the Horn-eye Ghost Crab, named for the horn-like projections above the eyes (called a stylophthalmous) in adults. This is also a widespread species throughout the Indo-Pacific region. It has a squared box-shaped body with a darker marking toward the rear on its back, often in the shape of an H. Unlike the slower hermits, the ghost crabs were relative speed demons traveling at up to 2 meters per second making them one of the fastest land animals in relative terms traveling up to 100 bodylengths per second. This behavior is hinted at by their scientific name (“Ocy” = swift/fast + “podos” = foot in Greek). To aid in their getaway they can also quickly bury themselves in damp sand. Once buried, special hairs at the base of their legs absorb water through capillary action allowing them to remain away from the ocean for extended periods. 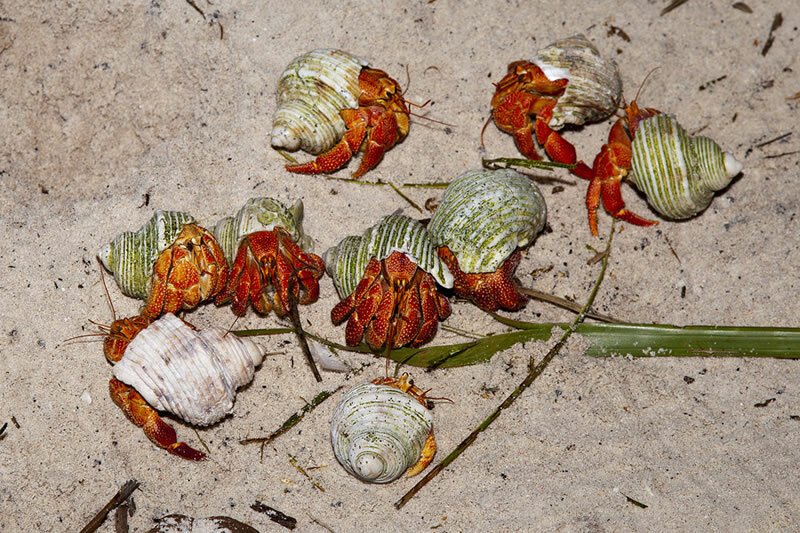 These crabs are not fussy eaters and frequently scavenge on a decomposing organic matter washed onshore. They also forage at the water’s edge eating mollusks, worms, isopods, fishes and crabs (even their own species). The burrows of this species covered the beach and without too much effort it was easy to spot several excavating new ones. They can extend down more than a meter below the surface and are dug by carrying out a small amount of sand with its front claws (chelipeds) and legs. The sand is dumped a short distance away from the opening before the grab returns for another load. Interestingly, the burrows of adult crabs make clockwise or counter-clockwise spirals as they descend. It seems that the direction is based on which cheliped is larger—those with larger right chelipeds dig clockwise and counter-clockwise for those with larger left chelipeds. Similar to the design of medieval castle stairways, this seems to help the crabs defend their burrows by allowing the most space for their larger cheliped. On one side of Middle Brother Island there was a large raised reef flat of eroded limestone creating many shallow tidepools. It was in this habitat that the Thin-shelled Rock Crab was most commonly seen foraging in the intertidal region. This crab species is related to the more boldly colorful “Sally Lightfoot” crab encountered in the Galápagos Islands. 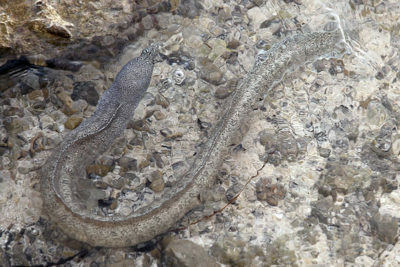 The tidepools were also inhabited by Peppered Moray Eels (Gymnothorax pictus) which have the unusual hunting technique of leaping clear of the water to grab these eels from the rocks. 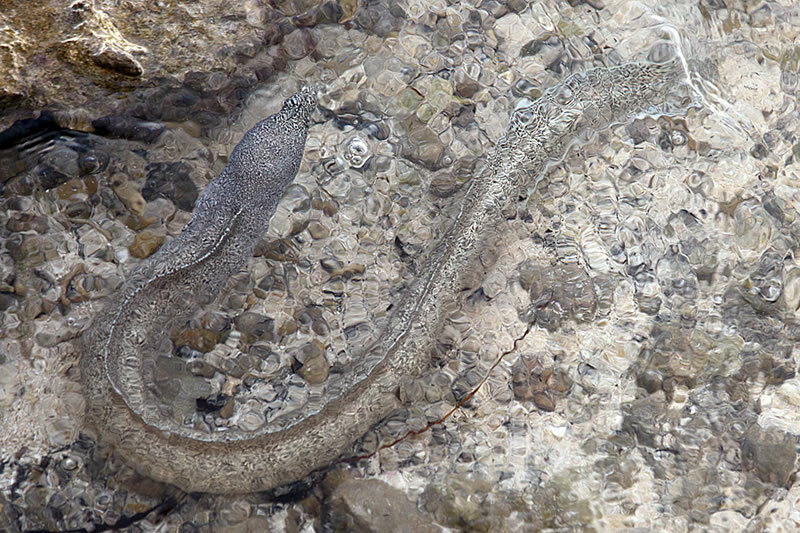 We saw these eels in the shallows and even out of the water among the rocks but did not witness the rarely observed behavior of the eels capturing their rock crab prey. The Coconut Crab is the world’s largest terrestrial arthropod, reaching up to 4 kilograms in weight and with a leg span of up to a meter. I had always wanted to see Coconut Crabs in their natural environment but in many areas their populations are seriously diminished due to over-collection for food or from habitat loss and introduced species like rats. The Coconut Crabs that inhabit the Chagos Archipelago represent one of the most undisturbed populations in the world and so it was relatively easy to spot them on Danger Island. Once an opening was located through the shrubby growth along the beach, it was possible to get into the forest of coconut palms. This area was dense with coconuts on the ground (many sprouted and ready to grow quickly if a storm knocks down a larger coconut palm thus opening space in the canopy). 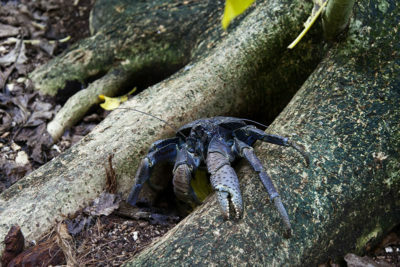 It was in this habitat that I found the highest density of Coconut Crabs. Smaller ones could be seen wearing discarded coconut shells that had been opened by larger crabs. 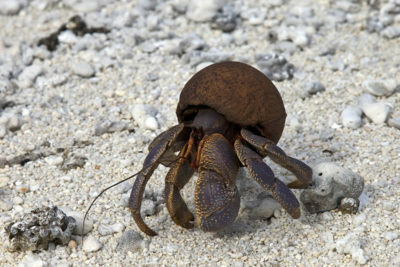 This crab species is related to terrestrial hermit crabs (like the Strawberry Hermit Crab) but only uses shells when it is young to protect its soft abdomen as it doesn’t need this protection once it grows to adult size. 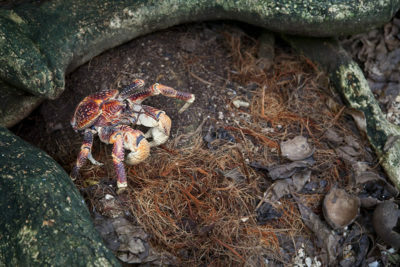 Although it eats a variety of fleshy fruits and will also scavenge organic matter or prey upon smaller crabs, it is most notable for eating coconuts as its common name implies (it’s also known as Robber Crab and Palm Thief). In addition to feeding on fallen coconuts, it is able to climb trees in order to drop coconuts. With its strong claws it removes the husk from around the inner nut. The nut then is opened by banging their claws on the three germination pores of the nut to crack into it. Coconut crabs have also been observed to take dehusked nuts back up the palm tree to drop it from a height to aid in cracking it open. Now that I’ve seen Coconut Crabs in their natural environment my new goal in the second leg of the mission in the Chagos Archipelago is to see if I can spot some of the truly enormous ones and to see if I can find one climbing a coconut palm or eating a freshly opened coconut.